Compressed air couplers are part of the compressed air air line connection tag team, the couplers and connectors. There is a page about compressed air connectors on this site too, if you wish more information on them. 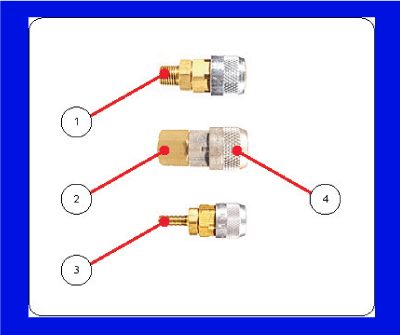 If you have threaded an air line connector into the supply port of each of your air tools, which is what you want to do to be able to connect a compressed air supply to each quickly and as needed, those connectors allow the quick connection of any air tool (or any other air component, for that matter) to a mating coupler on an air hose. In the photo below all of the couplers are from the same manufacturer though each has a different method of being connected to an air hose or air appliance. In the photo above, items 1-3 show various methods by which the coupler can be connected to an air supply line. Item 1 shows an NPT thread, item 2 is a female NPT thread and item 3 is a barbed fitting. Item 4 Shown On Each Of These Air Couplers Is Very Important! Item 4 in the photo above is the critical concern when acquiring couplers. When buying couplers you need to make sure that the internal configuration of the new coupler (the inside of item 4 shown in the image) matches the external shape of the mating connector. In order for the coupler to connect properly to the connector, they must be a compatible design. If not, you may not be able to insert your connector into the coupler at all, or if you can, it is possible that the two will blow off unexpectedly. Though there are some industrial standards for couplers and connectors it is an unfortunate truth for compressed air users that sometimes a coupler from one company won’t fit the connector from another company, and the reverse is true as well. When you select new couplers for your home workshop, it is convenient and easy to buy kits with matching couplers and connectors. What I normally do is select one brand from my local outlet, buy lots of couplers and mating connectors, and then discard all of the others that do not connect, or are suspect. Do yourself a favor and only keep compatible brands of couplers and connectors in your tool crib or tool box. For the industrial user, you can purchase quality couplers and connectors from your industrial compressor distributor or industrial supply house. Same rule applies. Only keep compatible brands in stock. Otherwise you’ll always grab the wrong one when working on a new application, necessitating a trip back to the tool crib and wasted time. As a home workshop coupler user, expect that the low cost, big box store couplers and connectors are sometimes hard to connect, may too easily disconnect, and they leak, particularly if you “side load” the coupler/connector at all. It’s very easy to do. If you are using an air drill or grinder or air nailer or any air tool that has its connector plugged into a coupler on the air hose, it is almost impossible not to impart a sideways motion to the coupler-connector connection as you are using the tool. In so doing, you are side-loading that connection. When that occurs, the coupler/connector can leak, particularly if it is a low cost set. You will hear the connection hissing, and in so doing, bleeding compressed air, the energy that was used to compress the air, and the money you spent on that energy, to atmosphere! If you buy good quality couplers and connectors, they are more reliable, easier to insert and remove and are generally able to better resist leaking, important issues if you are using compressed air regularly and often. Some couplers even offer additional functions such as an integral relief valve to vent trapped compressed air safely before disconnecting the coupler from the connector, a considerable improvement over popping the two apart when there is air trapped in the line. For most DIY users however (including myself) the low cost of our couplers and connectors offset the annoyance of periodic leaks and connection foibles, though I sure do curse the darn things from time to time. There is often a lot of grunting and hissing occurring when one tries to insert a connector into a coupler. Inserting an air connector into a coupler. The grunting is from the person who is trying to hold the coupler, slide the knurled ring back towards the hose with the same hand, and at the same time trying to insert the connector into the coupler with the other hand. Escaping compressed air provides the hissing, while we grunt, trying to get the darned things to connect. It seems that we never have enough hands. In the photo above, item 1 is the coupler. One way to connect the two is to simply push the connector into the coupler. A good quality coupler may simply snap back and into place, holding the connector tightly. Of though it is necessary to hold the coupler and hose in one hand, and pull back on the sleeve (the knurled part) of the coupler with the fingers of that same hand. At the same time, you push the connector (item 2) into the coupler with the other hand until it bottoms out. When the connector is inserted / seated all the way, you release the knurled ring on the coupler (not the coupler itself, just the ring) which is spring loaded, and it snaps forward. You then, carefully, ease off on holding the connector just bit, until you are sure that it has been captured by the coupler. Don’t let go of either component completely until you are sure they are mated. Sometimes they pop apart, with a lot of hissing. Been there and done that!